Lorne Matalon is reporting on the Mexican election and joined us to talk about the presidential race. Right now, the leading candidate in Mexico’s election is Andres Manuel Lopez Obrador, the former mayor of Mexico City. The ardent left-wing nationalist has been leading the polls in Mexico by double digits. Matalon also says U.S. President Donald Trump has become a player in the presidential race in Mexico. Texas energy companies began operating in Mexico in 2014, after Mexico agreed to allow foreign energy companies to operate inside the country for the first time since 1938. Some in Mexico, however, aren’t happy with Lopez Obrador’s position. “If they start reviewing everything, we are going to slow down, put more regulation, put more roadblocks, so things will continue happening but at significantly slower pace than what they need to happen,” says Ignacio Quesada, a former CFO for PEMEX and current member of the board of International Frontier Resources, an early entrant into Mexico’s energy reform. Although Lopez Obrador has been leading in polls, Matalon says his victory isn’t a guarantee. “This is Mexico and there is the potential for surprises around every corner when it comes to electoral tabulation,” says Matalon. 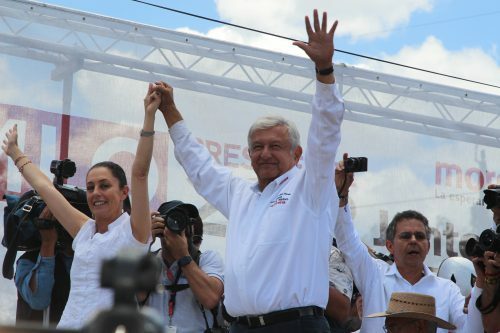 Lopez Obrador has twice been defeated as a presidential candidate, in 2006 and again in 2012. It is widely believed that Lopez won the 2006 election by a slight margin. He maintains to this day, as do many Mexicans, that he was the victim of vote manipulation in 2006 when Felipe Calderon was declared president by Mexico electoral commission. This entry was posted in KRTS News, KXWT News and tagged AMLO, Elections, Energy, Lorne Matalon, Mexico, Texas Energy. Bookmark the permalink.